Elrond (S. ‘Star-dome’), son of Eärendil and Elwing and brother of Elros, was one of the Peredhil (he had the choice of being counted among either the Elves or among Men). Born in Arvernien, he was captured by the sons of Fëanor when they attacked in the hopes of recovering the Silmaril. At the end of the First Age, the Valar presented Elrond and his brother with the choice of joining either the race of Men or Elves; Elros chose the former, and was selected as Númenor’s first King, while Elrond, joining the Elves, was made an Eldarin lord of great wisdom and power. He dwelt with Gil-galad in Lindon until SA 1695, when he was sent to Eregion to aid in the defense against Sauron. When that realm was overrun two years later, Elrond fled with the surviving Noldor and founded Imladris (Rivendell). During the War of the Last Alliance, Elrond marched with the Host as Gil-galad’s Herald. He bore Vilya, the greatest of the Three Elven Rings, which Gil-galad had passed on to him; this ultimately saved the Ring from destruction, as Gil-galad perished in battle at the hand of Sauron. 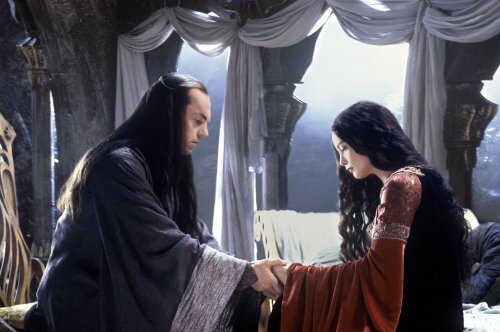 Elrond married Celebrían, daughter of Galadriel and Celeborn, in TA 100; Elladan, Elrohir, and Arwen were their children. Throughout the Age, he provided the Dúnedain of the North with aid (military and shelter) and counsel. He took in the Heirs of Isildur after the North Kingdom fell, and in his House also kept the treasures of Isildur’s Line – the Ring of Barahir, the Shards of Narsil, and the Sceptre of Annúminas. At the end of the Age, he departed over Sea with the Last Riding of the Keepers of the Ring, where he was at last reunited with his wife; but he was for ever sundered from his three children, each of whom had chosen Mortal life. Hi :) Great blog! I like the idea of "365 Days of Middle-earth", will surely keep coming back to read more. Where in the story do we learn about the fates of Ellodan & Elrohir?